Landscape Archaeology is a crucial topic, fundamental to understand any site. While there are plenty of projects focused on 3D reconstructions of Roman buildings, landscape archaeology is still not enough treated by virtual museums. 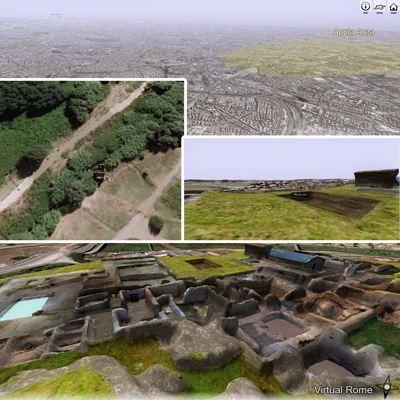 This testbed focuses on an interested case study, that is Roman landscape. How Romans used their territory in the area around Rome (suburbium)? How they modified its natural aspect to comply with the urban development and the increase of population? How were organised villas in the suburbium? The new Virtual Rome testbed (2014) is entirely cloud-based using a new web-based service called "Cloud Composer". This approach allows a robust and consistent creation of collaborative scene-graphs into the cloud, thus aiming at the generation of complex virtual environments online, such as large landscapes or reconstruction of large ancient cities. The system back-end is based on the open-source ownCloud solution, providing good adaption to different editing clients (browser-based, ownCloud client, etc.) and a drag-and-drop approach for easy hierarchy and scene composing. The actual collaborative scene-graph can be explored here. The overall system design is conceived for different dissemination Front-Ends (OSG4WEB, X3DOM and other scenegraph-based framework and libraries). The actual Virtual Rome testbed leverages on the OSG4WEB plugin. The integration of the Cloud Composer system with OSG4WEB Front-End (OpenSceneGraph for the web) allows to collaboratively edit or update the global scene by different people or teams. 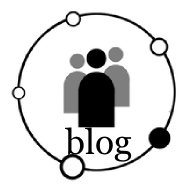 Since the ownCloud integration, it also provides fine-grained access policies, such as allowing - for instance - a remote team to modify only a sub-graph of the whole scene (e.g. : only the "Villa di Livia" sub-graph) or even different part of action scripts and interface elements. This approach has a great flexibility when dealing with complex virtual archaeological projects involving large 3D landscapes, along with the advantages related to cascading geo-referencing operators (per-node transforms): this well suits reference systems of 3D content produced by 3D modeling software, such as Blender. The scene-graph nature of the system in fact, allows a clean organization of 3D models and elements. Within Virutal Rome testbed, the terrain group alone is holding a paged dataset of around 20.000 tiles, leading to around 2 Gigabytes of multi-resolution terrain efficiently streamed through the web, thanks to state-of-the-art paging mechanisms. 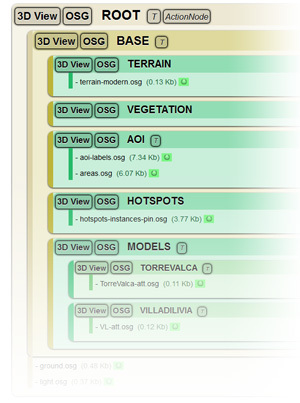 There are also other groups managing vegetation, areas of interest (AOI), archaeological sites, 3D models and other. Datasets and items can be as well distributed among different servers to balance server load on client requests. The new Virtual Rome interface is entirely cloud-based as well, allowing remote control and access to the look of icons and other GUI elements such as informative panels, floating labels, 3D pins and many other. Each node into the cloud-graph can encapsulate a OSG4WEB action script, providing full control over user interaction, event triggering and virtual world modifications (lighting changes, scene portions properties, sub-graph switching and much more). In this testbed, fly-to and switching actions between past and present will be employed. The actual interactive 3D demo (Touch-screen enabled) can be publicly visited here.